Home / Why Should You Switch to ELEX WooCommerce DHL Shipping Plugin Today? Whether it is about Domestic shipping or International shipping, very few services are as good as DHL today. It is needless to mention that it provides a complete fulfillment solution for an e-commerce of any size. Let’s see why should you switch to ELEX WooCommerce DHL Shipping Plugin with Print Label today. We are the Official DHL Partner for the integration of DHL Services with WooCommerce. The plugin works for DHL Express, DHL E-Commerce and DHL Paket customers of DHL. This clearly means that WooCommerce store owners from all around the world can use the plugin. The DHL Express part of the plugin is Verified by DHL International (UK) Ltd. and thus store owners can use it and comply with all requirements by DHL. Since the plugin also offers the official DHL Paket integration Approved by DHL Paket Quality Control, it can be used by store owners in Germany too. DHL e-commerce is for the customers in America, Asia, and Africa. In our Beginner’s guide to International Shipping, you can find basic information before going international with your shipping. Here we’ll see the what DHL brings to International Shipping. DHL offers fast international shipping where it picks up your shipment immediately and then performs a door-to-door delivery in the least time. Services usually vary with destination country. You can check here if the service is available for the particular country. The one-day export services by DHL are Sameday Jetline and Sameday Sprintline. Both of these services are available for Business to Business needs. Jetline refers to the same day services which use air services and Sprintline refers to the road transport. So if the export is to be done to a place not connected by the road, DHL uses Sameday Jetline. This function is imparted wonderfully in the plugin, where you can restrict the countries you want to offer the shipping. For instance, you want to offer international shipping to three countries only. To make this happen you choose the option of ‘Supports Specific Countries’ and select the countries by typing first few letters to get the country. With service having time mentioned in their names deliver packages before the time mentioned. For instance, if your customer selects DHL Express 9:00, then the delivery happens before 9:00 am. There is a money-back guarantee with the time limit, so you can confidently and offer these services to your customers. To select these services you need to go to the ‘Rates & Services’ tab and select Shipping Services from the list and & carry out price adjustments. Express Worldwide delivers packages by the end of next business days. Express Envelop is for documents weighing up to 300g and the delivery takes place by the next business day. And finally, the Express Easy Service is for deliveries where shipments are paid for at a DHL service point. Find your nearest DHL Service Point. This allows packages between 500d and 25Kg. All these services depend on the destination and sometimes deliveries are available form specific countries only. DHL GlobalMail Business comes under the Day Definite shipping services of DHL and is not the fastest of all services. The delivery of packages may take a few days. This is suitable for not so urgent deliveries and is cost-effective. Usually, most customers go with this option as shipping of heavier products s done with this. Tracking and customs clearance is taken care of by DHL. This has both Priority and Standard delivery options. Tracking service for this service is also available with the plugin. Price adjustment can be done in two ways in the plugin. One in terms of $ and other in terms of % of the actual shipping charge. Positive value added to the shipping charge and a negative value reduces the shipping charge by that amount. For instance, if you put $5 in the adjustment, and the shipping charge is $40, the customer will see $45 as the shipping charge. Similarly, if you put -5% in the adjustment section this reduces the shipping rate by 5%. ‘DHL eCommerce’ is the brand name for the fulfillment services by DHL for the Americas, Asia Pacific, and the Middle East/Africa countries. Apart from showing shipping rates, it has offers services from pick-up to tracking of services. Return services are also included in this. Within WooCommerce, DHL e-Commerce has its separate set of services. These are different from DHL Express. Any store owner in the mentioned locations can use this shipping service with our plugin. You need to have an account with DHL to use this service from the plugin. Once you have the account, you can use the services offered by DHL e-Commerce for packing, shipping, and tracking. DHL Paket is available for shippers based in Germany only. Refer the Documentation of WooCommerce Shipping Plugin and check out the Live Demo Site with the premium plugin for a detailed understanding. When we talk about optional service, we refer services like insurance cover or environmental shipping. These services are not limited to the two mentioned earlier. You as a store owner can offer different services to your customers while shipping with DHL. In this way, you get to choose the best service as per your businesses needs. These services are available with all the package and can be offered by all store owners around the globe. DHL is one of the most secure and saves shipping service. In addition to this DHL offers financial protection to all its customers. This cover can be for any physical damage, loss of the shipment or any other unwanted damage. So if you leave a few conditions like ordinary leakage, normal wear, and tear, delay, extreme conditions like war, terrorist attacks or packing defect by your side, all packages can get insurance. A cover is limited to the value you declare on the invoice. So to declare the correct value of the content and maintain evidence. In case of loss, you get the shipping charge refunded along with the product insurance amount. The maximum cover can nor exceed 5 million EUR, in case of damage on a larger scale. The cover is not available for war-struct countries like Cuba, Iran, Myanmar, North Korea, North Sudan and Syria. International shipments from Afghanistan and Iraq are covered. Claim insurance before 30 days of the date DHL accepts your package. When the world is just celebrating World Environment Day, you can contribute to a balanced environment. You can offer an all-inclusive carbon off-setting service. By selecting this option your customers who want to balance their transport activities with activities that protect the environment. In simpler words, this service includes costs that contribute to DHL’s Carbon Management initiatives. So if your customer wishes to contribute to the emissions during the transport he/she can choose this service. As a reward, contributors get a certificate accredited by Société Générale de Surveillance (SGS). DHL Express gets you a managed waybill preparation, an efficient box packing, Print shipment label, and commercial invoice, and send packages to entered addresses. With DHL you being an occasional or an experienced shipper does not have a lot of impact on the efficiency you achieve while you pack products. DHL includes a customer specific and provides an easy access to packing service. Generally, when you prepare these shipments you require few resources easily available with DHL. If you ship dangerous items like alcohol or lithium batteries, you get to choose special services too. With DHL you get branded packing resources free of cost. Some packages for special shipments are included in paid packing resources too. You can be sure of getting packing materials like Thermo Packings for medical purposes too. You can also choose to buy packings for smartphones, tablets, and laptops that require durable packing. Order your supplies now. Now you can offer weekend delivery with DHL. You get to offer a Saturday pickup for you and Saturday delivery for your customers. This service is available to all locations. These Saturdays include public holidays too. And if you are sending products that require specific packing and vehicle, you can contact the nearest DHL Express office for any such arrangement. Hold for pickup feature helps you to hold shipment for free up to 7 days and a customer can collect the shipment anytime in these seven days. DHL offers the additional service where you can, ask for signature confirmation from the receiver. 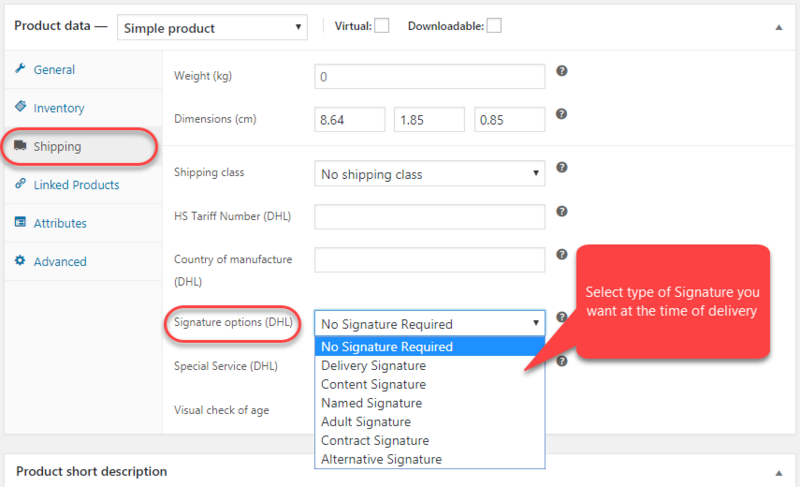 DHL collects the electronic copy of signature as a proof. This service is available free of charge with limits. And even if you don’t opt for a signature confirmation, DHL leaves the package at a safe place that you can confirm. When you use DHL, you have options to pay both online and offline. In WooCommerce, the payments and billing options are electronic. Shipping charges are deducted automatically from your DHL account. Online payments make it convenient to keep a track of transactions. Customers can also take a look at the saved data and download copies of invoices. There are two options of how you can pay for shipping and taxes. First, you can choose to charge your customers with an all-inclusive cost and pay shipping cost and taxes to DHL. And second, you can let the receiver to pay for shipping and taxes at the time of delivery. You can apply a partial or total Cash on Delivery. With DHL account, you can re-invoice an amount to a new account, request a new custom invoice or get the invoice on a different date. ELEX WooCommerce DHL Shipping Plugin with the Print Label costs you a one-time $69.00 and you are protected by our 30-Day Money Back Guarantee. It is a valuable integration to any WooCommerce store. This is because the location is not a bar for the plugin. You can use it and show shipping rates from anywhere in the world. DHL Express has it’s global presence and offers Shipping Rates, packing, shipping and tracking services, DHL e-Commerce provides complete fulfillment for stores in American, Asian and African stores. DHL Paket serves in Germany and provides logistics services for domestic and international shipping for German Businesses. So when a plugin has its use with all types of customers it becomes a good choice. DHL beats other shipping services in terms of additional services too. I hope the article leaves you with a clear mind. You must explore more of our plugins. Contact our online support in case you have questions or leave a comment below.